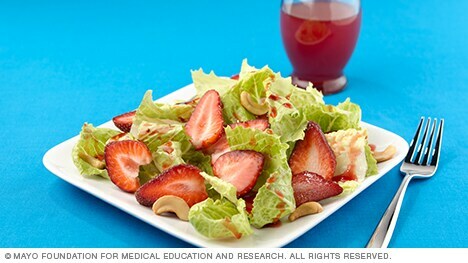 For this fresh fruit salad, combine 2 cups romaine lettuce and 1/2 cup sliced strawberries in a bowl. Drizzle with 1 1/2 tablespoons raspberry vinaigrette dressing and toss well. Sprinkle with 1 tablespoon cashews. You can enjoy this fresh fruit salad as a snack, side dish or even as a light meal.